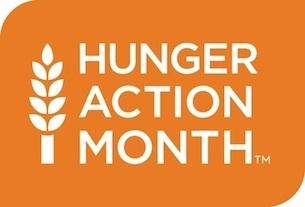 Nationally recognized as Hunger Action Month, September shines a light on the movement to reduce food insecurity and hunger in our country. Did you know that recent survey data* shows almost 17 million children live in food insecure households? These are kids who don't know where their next meal is coming from or how they will find something to eat when they are not at school. 1. Find your local foodbank. Donate food and/or your time to your local food bank, click HERE to find a food bank near you. 3. Make a meal for a local homeless shelter. Make it a family affair, connect with your local faith group or nonprofit to find a family shelter and schedule a meal your own family can provide. 5. Get the app. Download the CookingMatters in partnership with NoKidHungry, click HERE. 7. Spread the word on social media. Find sample tweets, posts and pins from FeedingAmerica HERE and spread awareness. 8. Spark children to action. Alott extra allowance one month and have kids research a local charity that addresses hunger to which they can donate their money. 9. Turn your celebrations into donations. Hosting a party or a family get-together? Encourage attendees to bring 3 non-perishable items to donate and have your kids decorate a box to place at the doorway to collect food. 10. Be aware. The greatest problems facing our communities are those which are ignored. Be aware, be informed and most of all, take action! We highly recommend the creation and support of employee led engagement teams as a best practice in corporate volunteering and giving programs. If you have these teams in place, or you lead a team, you may want to consider the following five elements when planning your next employee volunteering or giving event. When you’re choosing a volunteer project for you and your fellow employees, make sure you have a specific goal in mind. The more specific the goal of the event, the more likely it will motivate others to want to achieve it. - Impacts – this is about immediate and long-term change: what may change in the community, the company or even among employees as a result of the volunteering event?For example: “employee perspectives towards issues of homelessness in our community are more informed and they have clear opportunities to take action and are working to address the issue.” Remember: be bold! The Microsoft Citizenship Report is a good example of understanding these 3 types of goals. The team of employee volunteers must believe that the project or event will have significant impact for the community and the business. This is particularly important when inviting colleagues who have little experience with volunteering (which is most people, statistically speaking). Everyone wants to know they ‘made a difference’ when they gave their time or money. Taking some time to understand what this difference will be and how their contribution achieves it is incredibly important. Gathering everyone together for a “brief” prior to the volunteer activity is a best practice for clearly communicating meaning. The objectives of the event must be clear enough to determine how well they are achieved. Your fellow employees will want to know what kind of progress was made through their volunteering. If you didn’t solve hunger by passing out 1000 meals, what did you achieve? Underscore what was achieved during a ‘de-brief‘ following the event. But to do this well; it’s very important to know what you’re measuring. Taking the time to be specific with your goals will make measurement much easier. Tax Deductions 2011 - Does the Tiny Charitable Mileage Rate Need Increase? Charitable donations of goods are a tax deduction, some car mileage is too. The business mileage rate, however, is more than 4 times the tiny charitable mileage rate, which impacts millions. Our mission at VolunteerSpot is to make volunteering easier for everyone, to get rid of the little hassles that make it harder for more people to sign up and help. Congress sets a tiny 14-cent per mile rate for charitable driving, this can force some people to stop volunteering. That's why we are working together with organizations and individuals everywhere who care about volunteers to fix the charitable mileage rate -- with a #TinyCars approach. Gas prices are soaring! This directly affects the good work of non-profits everywhere, prohibiting volunteers from being able to afford to help. 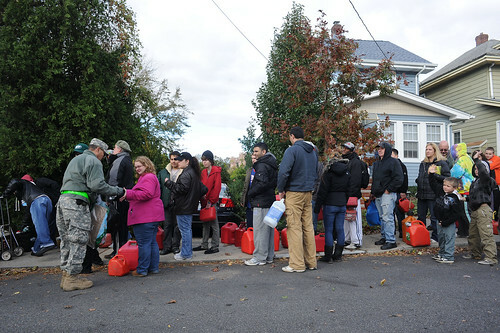 Read more on the high gas price issue in the news and how we can help change the charitable mileage reimbursement rate! Join us to create a unified voice on the charitable mileage rate issue. Share the message everywhere - email, blog, newsletter, pinterest, twitter, facebook. Congress Needs to See Public Input on the mileage rate issue - Encourage visible support for the mileage rate increase by using non-partisan PopVox to show Congress people care about this issue. A bi-partisan bill HR 387 "Charitable Driving Tax Relief Act of 2011", sponsored by Rep Tom Petri (R-WI), Rep Donald Payne (D-NJ) and Rep John Duncan (R-TN), is the focus of our #TinyCars support. Nonprofits especially should register as organizations and show their support. Volunteers can't deliver meals to seniors, mentor kids, rescue animals, rebuild homes or respond to disasters in #TinyCars, yet Congress offers just a tiny 14 cents a mile tax deduction or allowable tax-free reimbursement for volunteers putting charitable mileage on their cars. Unlike the business mileage rate, the charitable mileage rate is controlled solely by Congress, which set it in 1997 when gas cost $1.30 per gallon. The actual mileage rate (what volunteers really spend) is more like 50 cents spent per mile donating their critical services. With hard times squeezing personal budgets everywhere, some volunteers have been forced to make the difficult choice to stop donating their time when it requires driving. The limited mileage deduction and mileage reimbursement allowed by Congress makes helping others unaffordable. By contrast, the 2011 business rate is set at 55.5 cents for the second half of 2011. It seems like Congress thinks Volunteers drive #TinyCars. Thank you for joining us in support and celebration of America’s Volunteers! With more than 1.2 million volunteers in service, VolunteerSpot is the leading FREE online coordination tool that lets ANYONE schedule, sign up and remind volunteers at school and in their communities. We understand and applaud the investments of time, energy, and donations Volunteers everywhere willingly give - and everything we do is created to help them. Some of us are wishing there were extra days in December (or at least 25 hours in the day)! January is fast approaching and we’re still in holiday mode. Simple or elaborate, kick-start the New Year with a January volunteer gathering. Host a coffee break, a chili luncheon, potluck, or pizza party. Offer a look back at 2011 and present plans for the year ahead – goals, big events, greatest volunteer needs, introduce new leaders and coordinators, etc. Before the meeting, ask volunteers to share photos from 2011 events on your facebook page; request they add stories, anecdotes and favorite memories of their volunteer experiences over the year. Create a scrapbook from the images - publish a hardcopy for sharing or a pdf (soft copy) for emailing. Review the goals and accomplishments of your year of volunteering with hard numbers and facts -- from how many kids you helped read, to how many families were fed, how much money your fundraiser pulled in, how many badges your troop merited, how many games your team won, etc. Thank your 2011 volunteers with a slideshow or posters describing your collective impact, pictures of volunteers in action, and of course… treats! Ask for feedback. What worked well and what would volunteers like to see improved in the new year? Sometimes simple things like changing the start time of a shift or creating a designated volunteer parking place can make a world of difference. Outline your goals for 2012 and call for volunteers! Be ready with online sign up sheets to organize your new year, semester, or season of service. Share the link at your meeting and directly after via email. The New Year’s meeting is the perfect time for a fresh start to invite people who have not had the chance to volunteer yet. Let them know you would love to see them participate in 2012 – ask what special talents or skills they might be able to contribute and partner them with your active contributors. Here's to a brand new year in service! Let us know what your volunteer team or organization is planning for 2012 over on facebook! The fury of finals are over, and the much-needed trip home from college is concluded. College winter break becomes a haven of home-cooked meals and homework-free fun. While catching up with friends (and attending those obligatory family events), take a few moments to engage your charitable spirit in thoughtful holiday giving. Bring your friends and play with/socialize pets at a local shelter. Read holiday stories to kids at the library, shelter or community kitchen. Play chess and board games with nursing home residents. Social-media savvy? Help a nonprofit setup their facebook page or update their website and blog. Love the outdoors? Help refurbish a playground, clear trails or remove graffiti. 3. Give a Smile: It’s the holiday season, after all – so be extra nice! Make eye-contact and say hello to the homeless men and women you may encounter on the street. Fill your pockets with granola bars when you go out, specifically to give away. Buy a warm cup of coffee for a cold stranger, donate dollars and toys when asked to do so while shopping, and be patient and kind with small children. 5. Get Fit while Giving to a Good Cause: Work off all the holiday sweets and treats by entering a charity fun run! Running (or walking) in a race where the entry fees go to a cause you care about gives back to you and your charity. Recruit your friends, the more the merrier! 6. Donate a Round to Charity: While celebrating with your friends in town for Winter Break, agree to skip a round (or two) of drinks (or coffee) and donate the money to a local charity. Make the donation in the name of a favorite teacher, coach, or friend. The memories you’ll create during the short winter break weeks, while giving, sharing and volunteering, will be much more memorable and worthwhile than extra levels on a video game or ‘just another movie night.' Get out there and make your break count. Give back and lose yourself in the fun of serving others! As we celebrate World Volunteer Day today, Dec. 5th, we want to recognize the vast numbers of people across the globe who volunteer their time and talents in service to others. This day, we are taking the opportunity to reflect on what we’re accomplishing at home – how men and women in the U.S. are making a difference in their communities. In 2010, volunteers devoted nearly 8.1 billion hours in the United States -- giving time, expertise and “sweat hours” valued at nearly $173 billion! Volunteers are working to tackle some of the nation’s toughest challenges: tutoring students, preparing and distributing food, providing disaster relief, and helping veterans and families of active military. The Corporation for National and Community Service (CNCS), is the federal agency for volunteering and service and they have released new data on volunteerism. Volunteering in America is the most in-depth report on national service – spotlighting: who volunteers, which cities have the highest rates of volunteerism, and how Americans are serving their community. VolunteerSpot recently had the opportunity to chat with Robert Velasco, II, who was designated Acting CEO of the Corporation for National and Community Service (CNCS) by President Obama on May 27, 2011. CNCS is the federal agency that engages more than five million Americans in results-driven service through its Senior Corps, AmeriCorps, and Learn and Serve America programs, and leads President Obama’s national call to service initiative, United We Serve. When it comes to service, we learned 62.8 million adults from all walks of life, from a variety of organizations and public and private businesses volunteered to address community needs. We learned service also took place informally when people worked with neighbors to address or fix a community issue. In 2010, 8.1 percent of Americans, or 19 million individuals volunteered informally. When it comes to ratios, we learned women play a critical role in using service to solve pressing problems in their communities. Women continue to lead men in total number of volunteers (36 million to 27 million) and percentage who volunteer (29% to 23); women dedicated nearly 4.7 billion hours to helping their communities in 2010. We would encourage everyone to go to Serve.gov to volunteer in their area. Regardless of how much time you have, or what your interests may be, there’s a service opportunity that’s right for you. We it comes to parent volunteering, we learned busy moms and dads who volunteer aren't just improving their neighborhoods, but they also are strong role models for their children. Exposure to volunteerism at an early age instills compassion, empathy and the initiative to be part of the solution. Parents are vital to volunteering in the United States, with more than a third of parents volunteering last year. That’s roughly seven percentage points above the national average. When it comes to the specifics, we learned the leading service activities for women are fundraising (29%), food collection and distribution (27%), and tutoring and teaching (20%) - according to this year’s “Volunteering in America” report authored by the Corporation for National and Community Service. Men topped women in general volunteer labor activities (25%) and represented lower numbers in fundraising (23%) and food collection and distribution (18.6%). When it comes to paying it forward, we learned, people stick with volunteering when they can see first-hand how their service is making a real difference on an issue they care about. Women most often volunteer through a religious institution (35%), in education (28%), with a social service organization (14%) or at a hospital (10%). Parents are – perhaps unsurprisingly – most likely to volunteer at an educational institution (44%) than elsewhere in their community. Although the number of volunteers declined slightly from 2009 to 2010, the number of hours per volunteer actually increased– showing a strengthening commitment among those already engaged in service. Many people mistakenly think of service as selfless, but it’s often as valuable for the participant as it is for the direct beneficiary. Once people find the project, group or issue they can relate to, service becomes an enriching and fulfilling part of their life. We invite you to CNCS on Facebook and Twitter, or learn how you can volunteer in your community at www.serve.gov! And for even more information about Volunteering in America 2011, visit: www.volunteeringinamerica.gov. Turn Scouting Requirements into Compassionate Holiday Service! I’m new to Cub Scouts. And my little boy won’t even be in the troop until next spring! I’m learning the new Den Leader ropes as fast as I can (a little selfishly) so I’ll be able to better help him when he’s part of the fun. There are long lists of requirements for each Wolf/Bear/Webelos badge, pin or belt loop. The requirements increase as the boys get older. Younger boys may only have to pass off a few simple tasks for a similar requirement, whereas an older boy might be expected to check off several more time consuming responsibilities. TIP: Combining multiple requirements helps move the boys along on several awards at once. Let’s use the Recycle Achievement as my example. So many of the requirements include things like: talk to the boys about _______. Tell a story about _______. And then more talking and ‘teaching’. But the thing is… IT’S BORING! I’m a grown up and I find it boring. These little guys are 8, 9 and 10! I’ve gotta find a way to get through to them about keeping ‘Mother Earth’ green and caring about the environment. And ‘talking’ to them just ain’t gonna cut it. How to make the achievements fun and meaningful to a 10 year old boy? I brainstormed up an idea. We’re covering this subject in December— the season of giving, right? Why not combine a compassionate service idea with the requirements for the recycle award? Two birds as they say… and a whole lot more fun than a lecture! 1) Recycling & Sharing: The month leading up to the recycle den meeting, the boys will save all soda pop cans because we live in a state where the 5 cents is refunded. (Plus ask neighbors for their cans as well). 2) Pick a Pal to Serve: The boys will help select a boy their same age, from a family in need, or maybe the local hospital children’s wing.. someone significant to them. 3) Doing Trumps Talking: Instead of just ‘talking’ during the meeting we will have a whole lot of ‘doing’. First, recycling the cans at a local store. Then when they cash in the money we will immediately buy and wrap a toy any boy their age would love. 4) Secret Delivery: Doorbell ditch the chosen family’s home, or sneak into the hospital wing and leave the gift on the front desk. 5) End with Hot Chocolate of course! And all during the event explain and cover the goals of the recycle achievement. No need to discuss the act of service, the ACT will speak for itself in a language the boys are sure to understand! What is your troop planning for November and December? Which achievements can you combine into an opportunity to creatively cross off requirements, serve your community AND keep boredom at bay?